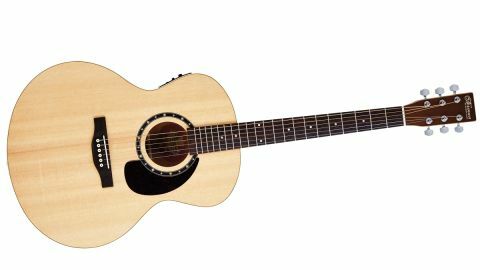 With its spruce top, it makes for a powerful sounding guitar that keeps on giving the harder you hit it. No second heel-placed strap button. The next level up from the cedar-topped Protege range is the spruce-topped Encore series. There are nine guitars again here, including a lefty, a cutaway and two folk sizes - there's also a lone mini jumbo, which we're looking at here. Again, construction is very similar, although the top here is a natural semi-gloss finished spruce, which gives a cleaner look to the guitar. It feels less cluttered as the deep, almost black, tortoiseshell pickguard seems to sit better with the maple-leaved rosette. There's a very similar neck feel, too, and in fact it's the wider body that brings the biggest difference, certainly when seated. Playing standing up isn't so straightforward, however, as there's no second heel-placed strap button - you'll have to fit one yourself, or use the ol' troubadour-style loop-around-the- headstock method. Acoustically, the sound here is noticeably different to the dreadnought - there's a warmer high-end and fuller low-end sandwiching a similar solid midrange. Plugged into the same system it actually sounds a little hotter in output, and stronger in the lower mids and while it's a perfectly good strummer it also works very well picked. There's a lot of strength to the sound and it'll easy work for a rock rhythm track managing to sound quite tough if you need although perhaps not quite as easy to dial in as the dread.